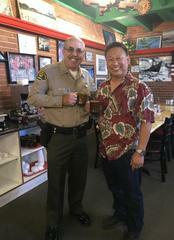 Coffee with a Deputy, this Thursday, October 11th, 2018 from 8am-10am at Crazy Otto's on Avenue I! Join us on Thursday, October 11th, 2018 from 8am-10am at Crazy Otto's on Avenue I for our monthly Coffee with a Deputy October is Domestic Violence Awareness Month and we will be sharing resources available throughout the Antelope Valley. We also have Halloween Safety Tips for all your little boys and ghouls! Your local deputies will be on hand to answer any questions you may have so make sure you stop by and have a cup of coffee with us!